There’s questions around whether trigger points cause fibromyalgia or whether it’s the other way around, or maybe the conditions aren’t even linked. One thing however is known for certain and that’s that you can have widespread trigger points (myofascial pain syndrome) and fibromyalgia at the same time. Hypersensitive spots in several parts of the body typify both myofascial pain and fibromyalgia. With fibromyalgia these spots are referred to as ‘tender points’ rather than trigger points. These conditions are easily mistaken for one another. Myofascial pain is usually localised and its cause is very definite in the form of trigger points, whose extreme tenderness gives away their location. People with fibromyalgia however often hurt all over and can’t even tolerate the slightest of touches. Tender points are usually present everywhere and are not just limited to muscles. The cause of fibromyalgia is believed to be systemic rather than something muscle specific and this is why the whole body is usually involved. Typical examples of myofascial pain syndrome include headaches that are often diagnosed as tension, sinus or migraine. Neck pain that radiates into the arm and forearm and into the lower back, thigh and leg it is often myofascial in origin. When a person does experience radiating pain of burning or numbness into their extremities and their MRI scans and EMG studies are normal, the symptoms are almost always myofascial pain. If the person receives treatment that is directed towards the myofascial element of pain their symptoms will usually improve. 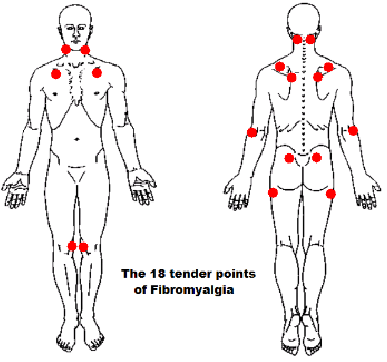 18 tender points of Fibromyalgia.